It hopes to launch "fully operational high-altitude tests" of the craft before the end of 2019. 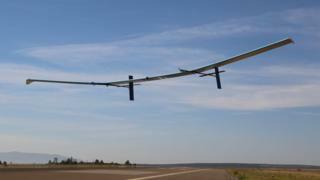 It operates from the same factory that once housed Facebook's Aquila internet drone project. "Our current mapping capabilities are driven by two efforts," explained Neil Ackroyd, acting chief executive of Ordnance Survey. "One is using fixed-wing aircraft to take photos for our revision programme. Then we have our field surveyors on the ground, supported by data from local authorities and the land registry. "What the Astigan project does is gives us the capability of using aircraft, but quicker and at significantly lower cost." "It's hard to see people vertically, as you can only see the top of people's heads," said Mr Ackroyd.